As this is being written the absolute monarchy of Saudi Arabia is making final preparations to behead and crucify Shia dissidents for peacefully protesting the armed demolition of their home town of Awamiyah. 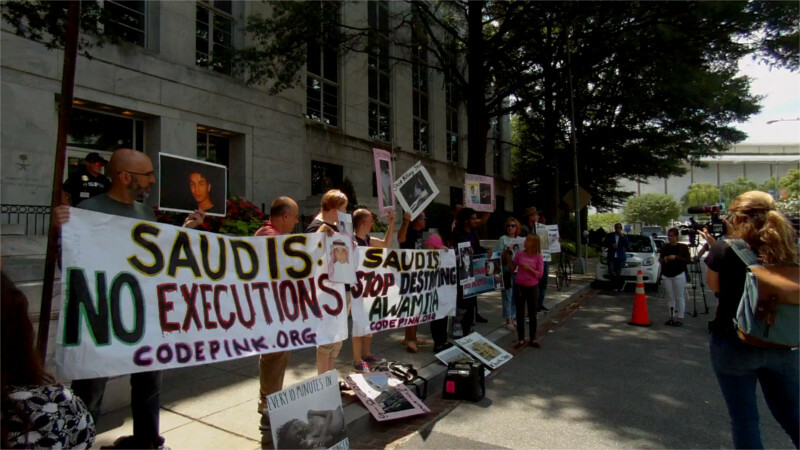 On the 10th of August, Code Pink showed up outside the Saudi embassy to protest these planned executions, the sort of behavior the US claims only comes from Daesh(ISIS). Donald Trump has continued selling arms to and making business deals with Saudi Arabia, saying nothing about the siege and destruction of the ancient Shia neighborhood of Awamiyah. The destruction of the community probably meets Trump's approval, as a "redevelopment" project preceded by the armed demolition of a community of his political opponents is probably something Trump wants to do in the US. Saudia Arabia is using heavy weapons, tanks, and troops for the equivalent of what in the US would be Trump using police carrying small arms to evict a Black or Latino neighborhood, then building condos for the rich. The false accusations that nonviolent protesters are "terrorists" is a tactic familiar from the US, used by the Saudi regime as well. While Trump cannot behead and crucify DisruptJ20 protesters, his prosecutors are threatening 200 people with between 75 and 85 years in prison, essentially life in prison. A famous Trump quote from the campaign was "remember the days when people used to be carried out on a stretcher." Thus, executions of protesters in Saudi Arabia probably provoke envy rather than anger in Donald Trump. Therefore, Trump is not going to do anything to opposed beheadings and crucifixions of peaceful protesters in Saudi Arabia. That is up to the rest of the human community and is a mandatory solidarity issue for anyone engaged in peaceful protest anywhere on the planet. The global community and the activist community must make it clear to Saudi Arabia that proceeding with these executions will have grievous consequences for the monarchy. In the US, investigation into the Saudi role in the 9-11 attacks, public denunciation of Saudi connections to Daesh(ISIS), and combining these with a call for a global boycott of Saudi oil would probably be the most damaging strategy. In Saudi Arabia itself, torture and execution of peaceful protesters in "chop-chop square" is a powerful deterrent to future efforts to keep political opposition peaceful. It is worth remembering that following the US invasion of Iraq, a single incident of US troops firing at protesters (after a helicopter accidently blew a flag off a mosque) was all it took to launch the insurgency.